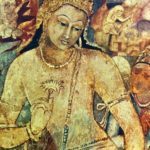 Hidden away in the hills of Northwest India, some 200 miles from the busy streets of Mumbai, emerge a magnificent jewel of art and religion: the Ajanta Caves. 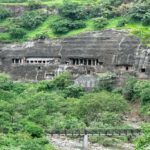 There are about 30 rock-cut Buddhist cave monuments which date from the 2nd century BCE to about 480 or 650 CE. 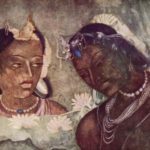 The Ajanta cave paintings and rock cut sculptures are described as among the finest surviving examples of ancient Indian art, particularly expressive painting that present emotion through gesture, pose and form. 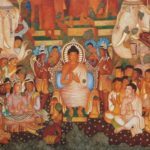 According to UNESCO, these are masterpieces of Buddhist religious art that influenced Indian art that followed. 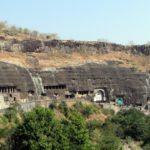 The caves were built in two phases, the first group starting around the 2nd century BC, while the second group of caves built around 400–650 AD according to older accounts, or all in a brief period of 460 to 480 according to Walter M. Spink. 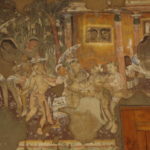 Mural paintings survive from both the earlier and later groups of caves. 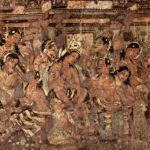 Several fragments of murals preserved from the earlier caves (Caves 9 and 11) are effectively unique survivals of ancient painting in India from this period, and “show that by Sātavāhana times, if not earlier, the Indian painter had mastered an easy and fluent naturalistic style, dealing with large groups of people in a manner comparable to the reliefs of the Sāñcī toraņa crossbars”. 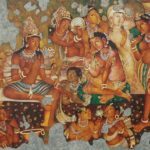 Four of the later caves have large and relatively well-preserved mural paintings which, states James Harle, “have come to represent Indian mural painting to the non-specialist”, and represent “the great glories not only of Gupta but of all Indian art”. 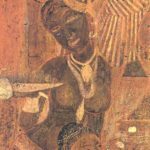 They fall into two stylistic groups, with the most famous in Caves 16 and 17, and apparently later paintings in Caves 1 and 2. 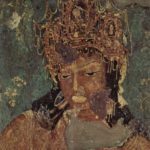 The Ajanta frescos are classical paintings and the work of confident artists, without cliches, rich and full. 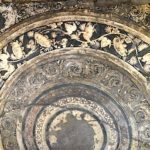 They are luxurious, sensuous and celebrate physical beauty, aspects that early Western observers felt were shockingly out of place in these caves presumed to be meant for religious worship and ascetic monastic life. 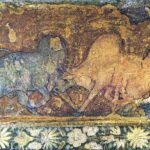 The main colours used were red ochre, yellow ochre, brown ochre, lamp black, white and lapis lazuli which was imported from Northern India, central Asia and Persia. The green was made by mixing this lapis lazuli with Indian yellow ochre. 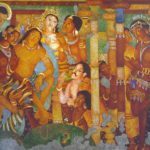 In the pictorial cycles, all the characters are bright and multi-coloured but are never repeated, a fundamental concept in Indian art. Ceilings, walls and pilasters are all covered with overlapping figures, brought to life by the artists with strong and contrasting colours. 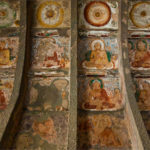 The painting techniques at Ajanta are similar to European fresco technique. The primary difference is that the layer of plaster was dry when it was painted. First, a rough plaster of clay, cow dung, and rice husks were pressed on to the rough cave walls. This was then coated with lime juice in order to create a smooth working surface. This painting can be found to the left on the main shrine. It depicts one of the most beloved bodhisattvas, Avalokitesvara. The term “bodhisattva” refers to a person that has been awakened by the Buddhist spirit. According to Mahayana doctrine, Alavokitesvara postponed his ascension into Buddhahood until he assisted every being in achieving Nirvana. Avalokitesvara takes the largest numbers of forms across Asia. Originally, a masculine form, Avalokitesvara is also known as the feminine Guanyin in China, and Kuan Yin in Japan. In the painting, his tan body, darkened only by the locks of curly hair, is delicate and elegant. He is adorned with pearls, amythyst, and other attributes of traditional Indian jewelry. On his head sits a magnificent crown, which at some point was most likely colored in extreme detail, but over time has faded. His eyes are lowered in a meditative state. His calm, spiritual face sets the tone and mood of the room. 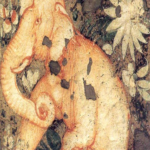 In his right hand, he holds a lotus blossom, which may represent his spiritual awakening.